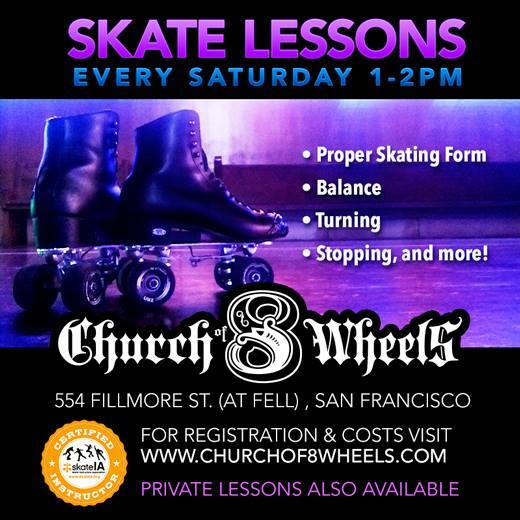 Our group skate lessons at the Church of 8 Wheels are great for those who want to learn the basics, and private sessions for those looking to learn additional skills! This class covers the fundamentals of skating technique. Includes proper skating form, falling, stopping and turning. We have several wonderful instructors on rotation each week. Class is for kids as well as adults! Drop ins welcomed and encouraged! Private lessons can also be arranged at the Church. Please reserve in advance by email. After class is over, improving your skating skills is all about PRACTICE! The Church of 8 Wheels offers 2 more public skating sessions on Saturday. It’s a great way to get more practice. Hope to help get you started on your skate journey soon! We had so much fun doing the Janet Jackson Roller Disco tribute a few years ago, the folks at The Church of 8 Wheels have graciously let me take over the booth for another great theme night! MOTOWN. Just on the tail of #BlackHistoryMonth, we’ll be celebrating the 60 year anniversary of the Motown sound – on wheels! Detroit is one of the original birthplaces of modern “dance skating” and is also the home of “Soul Skate,” one of the biggest, national adult skate jams. Early Detroit skaters had to fight segregation during the civil-rights era, but once they were allowed in, they changed the game! Thanks to pioneering skaters like Bill Butler, who brought their jazz records to the rink, we have the modern flavor and styles that we all enjoy today! Come down and enjoy 4 hours of great Motown hits plus lots of classic R&B, Soul & Funk to skate to! Tune in to HBO February 18th at 8 p.m. ET/PT and immerse yourself in an incredible skating world many never knew existed!! United Skates spotlights a community of thousands who fight in a racially charged environment to save the underground African-American subculture of roller skating. It’s a world that has been overlooked by the mainstream for generations while giving rise to great musical talents. Directed and produced by Dyana Winkler and Tina Brown, United Skates received the Documentary Audience Award at the 2018 Tribeca Film Festival among dozens of other awards. Rolling Stone online just shared an intriguing new trailer for the film! Skating in February 2019 means a shiny, new, refinished floor at the Church of 8 Wheels! Our group skate lessons are great for those who want to learn the basics, and private sessions for those looking to learn additional skills! This class covers the fundamentals of skating technique. We have several wonderful instructors on rotation each week. Skate music has it’s own unique groove to give you that “roll, bounce” action. There’s a reason that people have been rolling to these great old school tunes for decades! For those on Spotify, I’ve put together for you 4 hours of roller disco fun! These songs are the real deal! This is a loose recreation of one of my DJ sets at San Francisco’s Church of 8 Wheels. For best results, let it flow. Do not shuffle! For any skaters who also like gaming, The Sims 4 + Seasons Expansion pack offers your Sims the joy of roller skating (and ice skating)! I decided to create a “White Chocolate” Sim, and it turns out, she’s a better skater than me! Click the hotlinks for more information on The Sims 4, and the Seasons expansion pack! 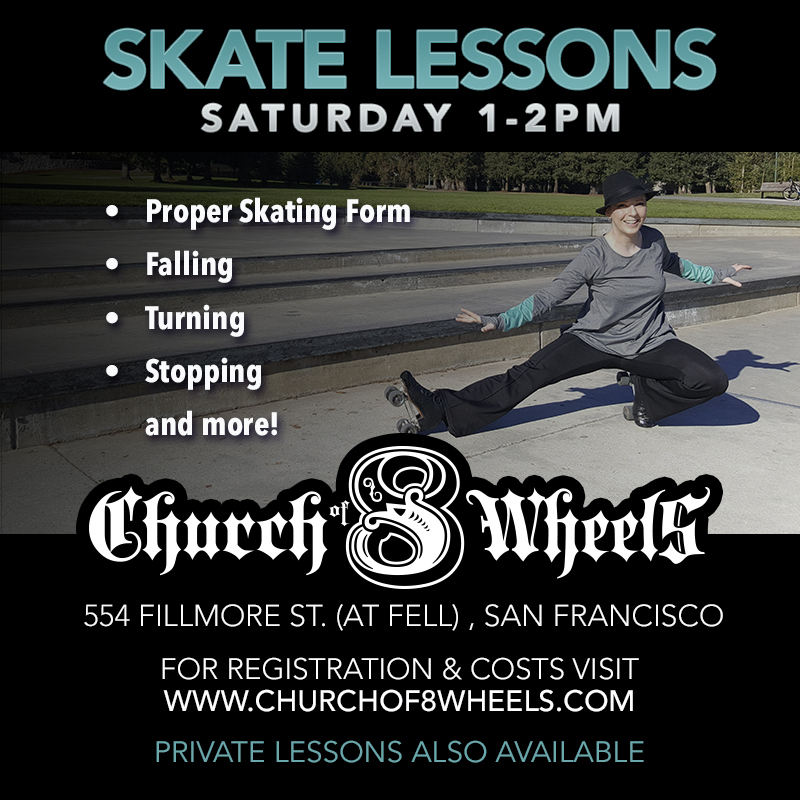 San Francisco’s Church of 8 Wheels hosts skate lessons for those who want to learn the basics, and private sessions for those looking to learn additional skills!